A longtime supporter of Chabad-Lubavitch was able to avert financial crisis that threatened its Australian headquarters. At a time of great financial strain on a Chabad-Lubavitch yeshiva in Australia, an influential community member and longtime supporter was able to avert financial crisis that threatened the closure of its Sydney headquarters. Harry Triguboff, a venerable benefactor of the organization, purchased two Chabad buildings in Bondi for $6 million, enabling it to pay off debts and continue operating across Sydney. Rabbi Eli Feldman, whose father, Pinchus Feldman, is Chabad’s chief rabbi in New South Wales, told J-Wire that he thought the long period of financial distress experienced by the community may have had something to do with a faulty letter in the building's mezuzot. After inspecting the mezuzot, he said that the one on the main gate was “deemed not kosher by the scribe,” adding that the faulty portion was directly related to monetary distress. “Just a week after a fully Kosher replacement was put up, the Triguboff transaction was concluded successfully and Yeshiva will embark on a new chapter with a sounder financial footing,” he told J-Wire. Under the deal, the Feldman family would no longer control the financial management of the yeshiva complex, but Rabbi Pinchus Feldman would remain the spiritual leader of the community and the head of the yeshiva. Rabbi Dovid Slavin will become a director of the complex and will control the finances. 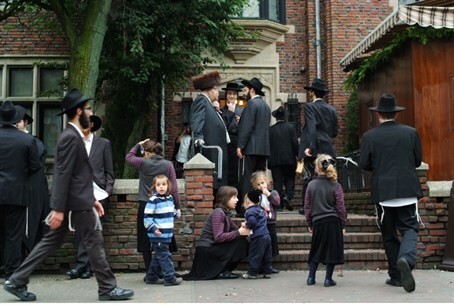 At a time of great need, the yeshiva was able to avoid closing its doors and can now proceed on a secure financial basis.